Just when we finally settled into a summer routine why does the calendar tell us it’s time to transition once again? For many children, the classic build up to the “first day of school” includes picking out special school clothes and meeting new teachers and friends. But, as we know, a changed environment and a modified schedule doesn’t always go smoothly for children with autism. Really, any variation in routine presents its own complexities. With a new school year on the horizon, let’s spend these final weeks of summer looking for innovative ways to approach the changes ahead. Long-term success can be reached through knowledge and preparation. As we reviewed potential content for our August issue, we kept in mind the multiple challenges families with children on the spectrum face this time of year — even when change is positive and educational strides are being made. That’s why we reached out to doctors, specialists, parents, and even a high school student with Asperger’s syndrome, to gain information on the best way for families to plot a course for a new school year. First, we are excited to introduce you to Annette Estes, PhD, Director of the University of Washington Autism Center and Ashley Penney, M.Ed., BCBA, a Behavior and Education Consultant at the center. In their piece, The Value of Getting to Know Your Child’s School Support Team, they encourage all parents to meet with a school support team to make the beginning of the school year less intimidating and stressful. Their advice is crucial to making a smooth transition. One of our regular contributors, Deanna Picon, the founder of Your Autism Coach, LLC, recommends families with a child on the spectrum take a step back and look at the coming year with a fresh perspective. In her piece called 7 Tips For an Amazing School Year With Your Special Needs Child, Deanna reminds families to communicate with teachers, become involved at school, know when to speak up and to celebrate all the milestones. Deanna’s tips are helpful for families with children of all ages. We also are happy to share an interesting piece written by Oriane Robison, the Residential Coordinator of a national post secondary program which supports young adults with Asperger’s, high functioning autism, ADHD and other learning differences. In How to Help Your ASD Child Navigate Through Life, Oriane describes the multiple challenges many people with ASD face a world filled with unspoken rules and subtleties that can be difficult to navigate. Being more aware of how a child on the spectrum may view tasks allows for improved communication and understanding. We are especially thrilled to offer our readers a unique perspective as Sydney Holmes, a high school senior diagnosed with Asperger’s syndrome, shares helpful tips for teachers on how to help ASD students reach their personal goals and feel more comfortable in the classroom. In Dear Teacher: Sure Fire Ways You Can Help ASD Kids, Sydney explains what can causes her stress and anxiety within the classroom and ways teachers (and other adults) can help Aspies reach their goals. We are delighted to share with you the guidance of Sally Thibault this month in Professional Tips for Combating Stress and Anxiety in the New School Year. As she explains in her video, it’s important for families and teachers to be able to identify and understand responses to anxiety and stress to in order help children on the spectrum. Her thoughtful perspective is valuable. Be sure to also check out Felicity Dryer’s article, Ways Technology Can Aid ASD Students in the Classroom, to learn how technology has advanced bringing autism education to a whole new level. Felicity has included information in her piece on relevant laws as well as vital assistance tools for your family. 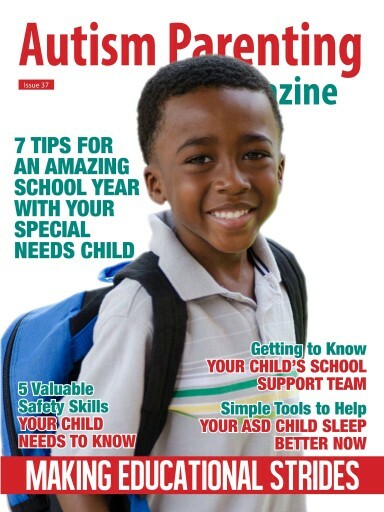 While I have worked for numerous magazines and newspapers during my career, I consider this past year working as Editor-in-Chief of Autism Parenting Magazine as one of my most rewarding. Interacting with so many outstanding professionals devoted to serving families affected by autism as well as connecting with dedicated parents has been especially meaningful. I want to thank our contributors who make an effort to educate our readers with the latest news as well as the families who have written to us to share personal stories and express gratitude. Enjoy the remaining days of summer with your families and cherish the memories made.